RAJASTHAN, land of a people who are brave and chivalrous, is a land of superlatives-every thing herein is breathtakingly beautiful, impressive and fascinating. It is packed with history, art and culture that goes back several centuries. Rajasthan has a total area of 343,000 sq. km and the most striking feature of this land is its division by the majestic Aravalli range which runs from north east to south-west for about 688 km. Northwest of the Aravallis are the Jodhpur, Jaisalmer, Barmer and Bikaner regions, it is the home of arid plains and the shifting sand dunes of the great Thar Desert. The other side of the hills is a land of rich in vegetation - Aravalli. Camel Safari is one of the unique way to explore small villages in Rajasthan. Camel Safaris at the top of this ship of the desert is most exciting and soft adventure. Riding a camel is not easy as people consider. It is neither a great test for endurance. It is a great experience to explore The Thar - a vibrantly, living, desert, very colourful and hospitable. The grand forts in Rajasthan are a major tourist attraction of the state. The best way to experience the royal legacy of the state is by exploring the historical forts of Rajasthan. A tour to these famous forts will give you a glimpse into the glorious history of the state. Almost all the important cities of Rajasthan have atleast one major fort. The forts in Rajasthan still have a mystical charm about them and are a must visit if you are planning to tour Rajasthan. In fact, Rajasthan is the only place in the whole world, which has the highest number of forts and palaces. Read on about the various forts of Rajasthan. After resting on arrival in Delhi, the Chandni Chowk bazaar is the place to go for the full-on Indian experience of crowded, twisting alleys and tiny shops. The brilliant red sandstone Red Fort (Lal Qila) was built by the Mughal Emperor Shah Jahan as his ruling palace in 1648. Opposite is the Jama Masjid, the largest mosque in India. Humayun's Tomb is one of Delhi's UNESCO World Heritage Sites. In South Delhi is the astonishing Qutub Minar a 72.5m minaret that was the tallest "skyscraper" in the world when built (1193-1368). Rajpath is the main parade route that leads to the President's residence (Rashtrapati Bhavan) and the splendid India Gate, a nice place for an evening walk when the buildings are lit, and the vendors come out to supply snacks and bites. The principal reason to visit Agra is of course to lay eyes on the impressive Taj Mahal, a mausoleum for the wife of Emperor Shah Jahan. As one of the worlds great wonders, the fabulous beauty of the building never fails to disappoint. Its white marble is ornamented with precious, semi-precious stones and texts. Agra also contains the most important fort in India, The Red Fort, which can be more accurately described as a walled palatial city. The great Mughal Emperors all lived and governed the Empire from here. The Diwan-i-Am (Hall of Public Audience) once housed the famous Peacock Throne. The Diwan-i-Khas (Hall of Private Audience) was used to receive kings and dignitaries, and features the black throne of Jehangir. The Sheesh Mahal (Glass Palace) is a royal dressing room featuring tiny mirror-like glass-mosaic decorations on the walls. The 'Pink City' of Jaipur is the capital city of Rajasthan and is a glorious introduction to the history of the Rajputs. The City Palace is a delightful blend of Mughal and traditional Rajasthani architecture, sprawling over one-seventh of the area in the walled city. The complex is divided into a series of courtyards, gardens and buildings including the Maharaja Sawai Mansingh II Museum which contains collection of royal costumes. The Hawa Mahal (1799) or Palace Of Winds, is a five story building that was originally built to enable the women of the royal household to watch the everyDay life and the processions of the city. The Jantar Mantar was an astronomical observatory, created by Maharaja Sawai Jai Singh II. Beyond the ramparts, the old city, has a wonderfully medieval flavour, and a walk through the rambling lanes will reap rich rewards for the curious, with markets selling cotton fabrics, carpets, jutties (slippers with the unique upturned toes) and ittars (traditional perfume). Amber is set atop the Aravalli Hills north of Jaipur. Within its forbidding walls lies a palace with a beautifully decorated interior. Approached from a steep ramp, visitors ride up on elephant back, entering through the grand Singh Pol Gateway. 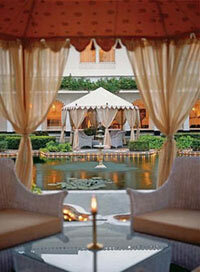 The palace at Amber offers a highly romantic insight into the medieval lifestyles of Rajput princes. Samode is famous for the beautiful Samode Haveli and the splendid Samode Palace, now both converted into First Class heritage properties. The Durbar Hall at Samode Palace has one of the most beautifully painted chambers in Rajasthan. The small towns located in the semi-desert region of Shekhawati are famous for a plethora of painted havelis, or splendidly frescoed mansions constructed by prosperous merchants. Once a major trading centre on the caravan route linking Central Asia with North India, Bikaner is dotted with many sand dunes, and the city is renowned for the best riding camels in the world. Junagarh Fort (1588) would have to be one of Rajasthan's most impressive fort complexes. The fort has a 986m-long wall with 37 bastions, a moat and two entrances. The palaces within the fort make a picturesque ensemble of courtyards, balconies, kiosks, towers and windows. A major feature of its fort and palaces is the superb quality of stone carving. Jaisalmer Fort (1156), merges with the golden hues of the desert and the setting sun gives it a fairy tale look. This is actually a living fort, with one quarter of the old city's population residing in it. The fort has 99 bastions around its circumference and is protected by three walls and is magically lit up at night. It is fascinating to wander around the fort packed with houses, temples, handicraft shops and honeycombed with narrow, winding lanes paved in stone. The fort walls provide superb views over the old city and surrounding desert. The fort contains a group of beautifully carved Jain Temples that were built between the 12th and 15th century. The Manak Chowk is the main marketplace outside the fort where one can walk through lanes where the famous Carved Havelis Of Jaisalmer are to be found. The carvings in the Jaisalmer Havelis are of a very superior quality. Gadisar Lake is located outside the city walls, and surrounded by small temples and shrines. A wide variety of waterfowl flock here in winter. Sam Sand Dunes are 42 km from Jaisalmer on the edge of the Desert National Park. A magical place, especially at sunrise or sunset where it is possible to take Camel Rides into the lonely shifting sand dunes of the Thar Desert. Jodhpur is the second largest city of Rajasthan, and sits on the edge of the great Thar Desert. The city is a great location for exploring rural Rajasthan with a visit see Bishnoi villages or even camp under the desert stars. The impressive and forbidding 15C Mehrangarh Fort is one of the most stunning hill forts of Rajasthan. It offers some excellent views of the old city. The fort itself, with its enormous gateways, has a fairy-tale feel with palatial apartments that have been built over five centuries of bristling history. On the way up to the fort is the Jaswant Thada Jaswant Thada - a cenotaph on the hill of Mehrangarh. The old city offers winding streets with colourful street markets and blue painted Brahmin houses. The colorful Girdikot and Sadar markets display a wide range of Rajasthani handicrafts. Tiny shops line both sides of the narrow lanes in these markets. One can find textiles, silver, handicrafts, aromatic spices, vegetables and colorful Indian sweets in these shops. Umaid Bhawan Palace (1929) is a beautiful edifice of marble and pink sandstone. This immense palace is also known as the Chhittar Palace and is now a grand and extravagant heritage hotel that is one of the most luxurious in princely India. The Bishnois are a simple village community who are strong lovers of wild animals. Their passion for protecting trees and wildlife has led to many tales of members of this community sacrificing their lives in order to protect their environment. If this is of interest, you can arrange locally to travel by jeep to visit their villages and buy beautiful home made rugs and handicrafts. Ranakpur has one of the one of the biggest and most important Jain Temple complexes in India. The main Chaumukha Temple has carvings of exceptional beauty. The Maharani Bagh, or Queen's Garden, is beautifully located at the foot of the thickly forested Aravalli Hills. It is a fruit orchard with acres of mango, lime, pomegranate giving way to intimate gardens in full bloom. There is a restaurant with a spectacular view of the hills and a charming village courtyard complete with thatched roofs and delicious Rajasthani cuisine. Udaipur captures the imagination like few other places in the world. Surrounded by gently undulating hills and set around peaceful Pichola Lake, it is a city of impossible beauty. The location is easily the most romantic in India with The Lake Palace on Jag Niwas island in the middle of the lake complimented by the grand City Palace on one bank with the Monsoon Palace on the hill above. Udaipur is also a centre for performing arts, craft and famed miniature paintings. The huge City Palace that towers over the lake, is the largest palace complex in Rajasthan. It is a conglomeration of buildings surmounted by balconies, towers and cupolas with wonderful views over the lake and city. The main part of the palace is now preserved as the City Palace Museum, housing an armoury and a large collection of artifacts. The rooms of the museum are extravagantly decorated with mirrors , tiles and paintings. The Mor Chowk (Peacock Square) has beautiful mosaics of peacocks. The Saheliyon Ki Bari is an ornamental garden built for the entertainment of the royal ladies. The Maharajahs Car Collection within the grounds of the palace include rare vintage vehicles as well as sleek and fast Cadillacs and Chevrolets. You can enjoy royal luxury at the Fateh Prakash Palace with lake facing suites in the turrets that are suitably appointed with four poster beds and period furniture, festooned with maroon velvet curtains and delicate silk tassels. The Durbar Hall at the Fateh Prakash Palace is undoubtedly the most lavish in India, and its sheer size makes one gasp in awe. The Crystal Gallery also has a breath taking collection of the finest crystals. Located near the City Palace, this fine Indo-Aryan temple dating from 1651 is the largest and most splendid temple of Udaipur and enshrines a black stone image of Vishnu Lord of the Universe. The picturesque lake is surrounded by hills, palaces, temples, bathing ghats and embankments. The lake encloses the Jag Niwas and Jag Mandir islands. The City Palace extends along its eastern banks. The Lake Palace (1743) is a magical fairy tale property located in the middle of the Pichola Lake on Jag Niwas Island. ToDay the palace is one of the most famous and luxurious hotels in the whole world, but visitors can book and turn up for evening dinner. A palace on the waterfront of Lake Pichola with a very interesting display of costumes and modern art. It stages delightful evening performance of Rajasthani traditional dance and music you can enjoy with a lovely view of the lake. Take an internal flight to Mumbai for a stopover night prior to your departure from India.